If you didn’t get to read “Finding Mr Flood” by Ciara Geraghty the first time round. Then, good news as it’s being re-released this Thursday, July 19th with a lovely new cover. I absolutely love this cover, beautifully illustrated with images of Paris and of course loads of dogs. 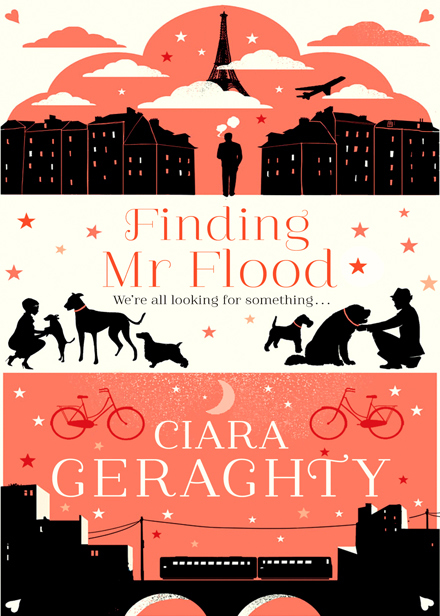 “Finding Mr Flood” is the second book I have read by Dublin author Ciara Geraghty and just like the first book, it was a heart warming and funny read. “Finding Mr Flood” tells the story of sisters Dara and Angel and their mother Mrs Flood. Thirteen days before she was born, Dara’s father Mr flood walked to the shop to get a packet of cigarettes and was never seen again. Her older sister Angel needs a new kidney and everyday the family wait for the call from the hospital hoping that one will become available soon. While they wait for this all important call, they all try to carry on with their lives as much as they can. Mrs Flood with her mobile hairdressing business and Dara works in the local dog pound with her friends Tintin and Anya and cares for each dog as if they were her own. Their lives are uncomplicated until one day Angel gets sicker and the need for a new kidney gets more urgent. So Dara decides that she is going to find Mr Flood and see if he could be a possible kidney donor, so with the aid of quiet private investigator Stanley Flinter, they embark on the mission, which could quite well be impossible. As she struggles with this journey, she begins to discover things about the father she never knew and the person she thought she was. I loved this book, it was a such an unique story with so many interesting characters. Ciara has a wonderful flair at creating characters, where you can see a little bit in yourself in each of them. Particularly with Dara, she was such an inquisitive character in her simplicity from how she dealt with the dogs to how she dealt with humans. The Dublin humour and sayings throughout the book made me laugh, especially with the scenes with Dara’s colleagues and Stanley’s flatmate Sissy. Finding Mr Flood is a lovely read, that is sometimes sad, but often funny. A book that I would recommend to anyone and everyone. You can buy Finding Mr Flood on Amazon and other good bookshops. Keep your eyes peeled on Handwritten Girl over the next few days as I will be announcing a “Finding Mr Flood” give-away!